As a young boy John Cyril Harrison showed an outstanding gift for drawing and his later sketch books reveal a rare talent for accurate observation and draughtsmanship. In fact, Ron Digby a highly respected contemporary bird artist said that he considered Harrison to be the finest draughtsman of all the British bird painters both past and present. Harrison studied at the Slade School of Art and improved his knowledge of anatomy through the practice of taxidermy. After that he moved to Norfolk where he became a keen supporter of the Norfolk Wildlife Trust. He was one of the most popular artists at the major sporting galleries and, in particular, The Tryon Gallery, where his exhibitions were eagerly awaited. Many of his paintings were so sought after, that collectors had to place their names in a hat in order to compete for the pictures they wanted. 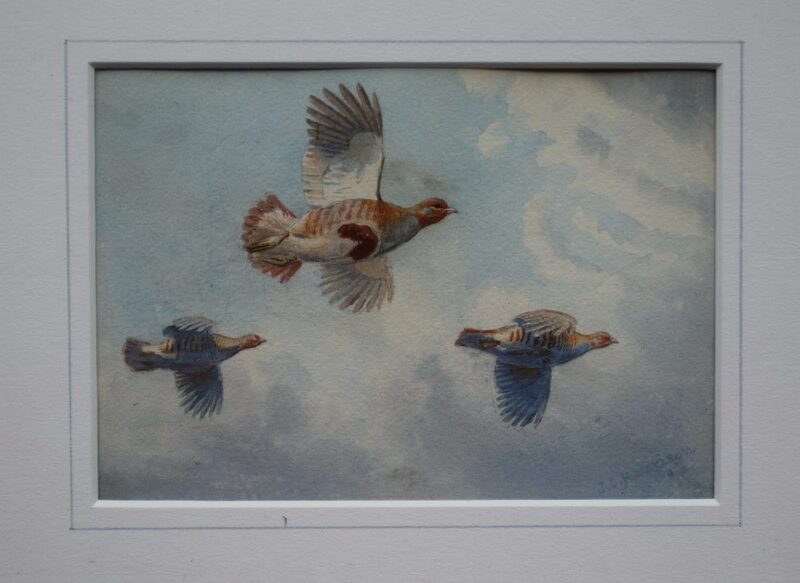 Harrison had a peerless reputation for painting birds in flight, indeed it was Aylmer Tryon himself who remarked that he thought that John Cyril Harrison’s birds in flight surpassed even those of Archibald Thorburn. He had a remarkably fluent style which gave him the ability to combine both realisms mixed with a hint of impressionism. That rare combination gave life and movement to his subjects and is the reason why many collectors and commentators rate his finest work as second to none. Harrison’s pictures have consistently enjoyed great success both in auction houses and galleries and he continues to have a very strong following.